Wyoming flags feature the silhouette of an American Bison on a blue field with white and red borders. The state seal branded on the bison contains a woman that represents the state motto "Equal Rights" and the two men represent cattle ranchers and miners. The words "Livestock", "Mines", "Grains" and "Oil" represent Wyoming's wealth. The eagle and shield show its support for the United States. Our commercial grade Wyoming flags are 100% made in USA and carry 6 months guarantee on construction. Offered in all standard sizes and in the popular fabric choices of nylon and polyester, these flags are made to the accurate specifications and precision. Shop from our complete line of Wyoming Flags right away and get the best prices, quick shipping and much more! 100% customer satisfaction guaranteed! 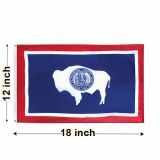 Show your state pride at its best with these beautifully crafted state flags of Wyoming. Choose from a range of popular sizes that range from the handy 3’x5’ to the massive 8’x12’ and everything in between. If you are looking for a spectacular flag display even in low wind conditions, choose these light weight Nylon flags made of premium quality 200 Denier nylon and finished with grommets and heading. Our flag feature UV resistant Dupont ink that will retain its color brilliance for a long time. Polyester flags are more suited for high wind conditions and coastal zones as these are fray resistant and heavy duty. Celebrate the spirit and the culture of the cowboy state with Wyoming flags from Tuff Flags. Be it as gifts, keepsakes or display items, these flags are born crowd pleasers for sure. 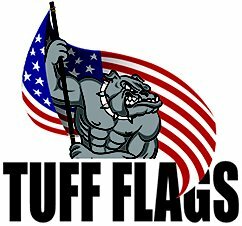 Our commercial grade flags that are made to the exact official specifications are well suited for schools, government organizations and defense units among others. 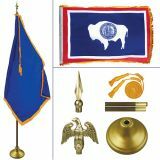 Browse our complete line of Wyoming State Flags to find a model that matches your needs. 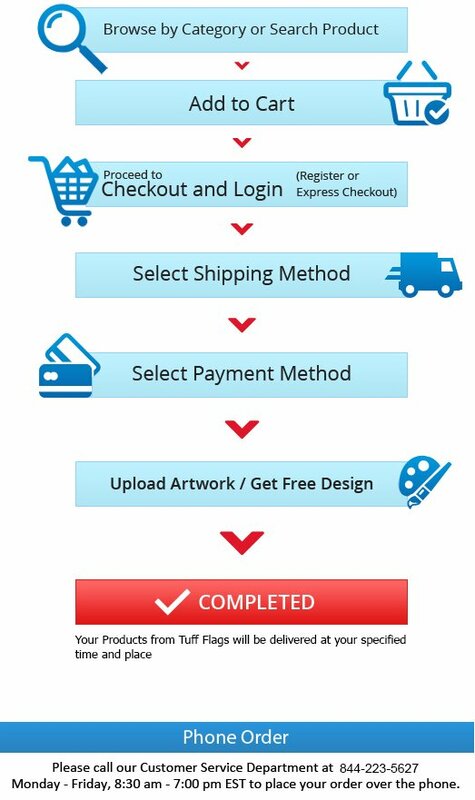 Should you have any questions or orders, call our toll free number (888) 287-3524 or email at customercare@tuffflags.com and we will be happy to assist.